Show Me The Movies: Solo: A Star Wars Story:Fun filled ride with one of cinemas best loved heroes! Solo: A Star Wars Story:Fun filled ride with one of cinemas best loved heroes! With more baggage than an airport carousel (original directors Phil Lord and Christopher Miller left the project in 2017 due to creative differences) and an estimated budget over $250 million making it one of the most expensive films ever made, to say that there was pressure on Solo: A Star Wars Story to deliver would be a huge understatement. Conceivably, with an accomplished director in Ron Howard behind the lens, an ensemble cast that included Woody Harrelson, Emilia Clarke and Alden Ehrenreich (who had the unenviable job of filling Harrison Fords's shoes as Han Solo) and Star Wars resident writer Lawrence Kasdan behind it, Solo: A Star Wars Story always had a chance of becoming an entertaining, thrilling and welcome addition to iconic Star Wars franchise and thankfully that is the case. Solo: A Star Wars Story is an adventure we get to share with the most beloved scoundrel in the galaxy. Through a series of close shaves deep within a dangerous criminal underworld, Han Solo meets his trusty future copilot Chewbacca and encounters the notorious gambler Lando Calrissian, in a journey that will set the course of one of the Star Wars saga's most unlikely heroes. Playing as a type of Space Western, Solo: A Star Wars Story has all the ingredients to please the fans of the series with fantastical creatures, thrilling set pieces, witty one-liners and is,by and large lots of fun. It appears on the outset to be a Star Wars feature that will appeal to the masses as background knowledge and references are kept to a minimum and with what has been a steady diet of Star Wars films over the last number of years that may not be a bad thing. Alden Ehrenreich excels in his role as Han Solo and Woody Harrelson and Paul Bettany bring their consistent best to the production that delivers as a fun filled adventure not to be taken too seriously. 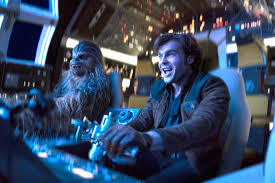 Whereas it may not hold the gravitas of previous films in the production and at times you do get the feeling that it's a film that thinks it's a lot slicker and stylish than it actually is, Solo: A Star Wars Story is not only another solid entry to this exemplary franchise but also another 2018 summer blockbuster that is worthy of your hard earned cash!